It is likely that you spend more of your hours awake at work than at home. I love my job, but that fact hurts a little. Considering that your desk is like a second home, I think it is worth investing a little time making it a cozy, productive space, right? Our new office space has an open floor plan, tons of natural light, and bright colors which makes a great environment. But my desk needed some work. I focused on 3 easy updates, and in less than an hour I made a clean, functional, and cozy space to support a productive day. 2. 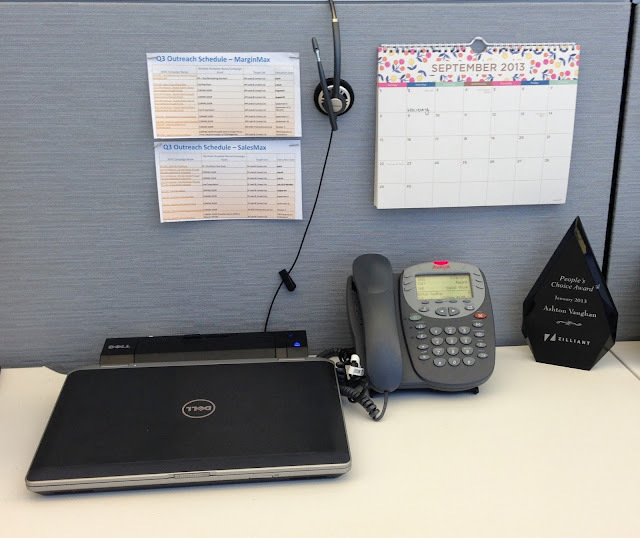 Personal Touches: Pictures, sweet notes, old cards...these little touches should be a part of every working space. 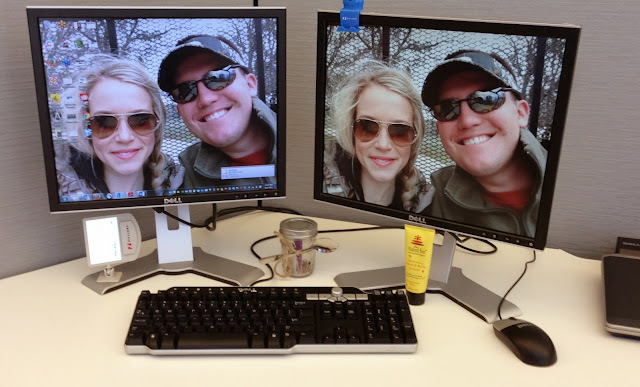 It's such an easy way to bring a little home to your desk, and it helps remind me why I work hard. 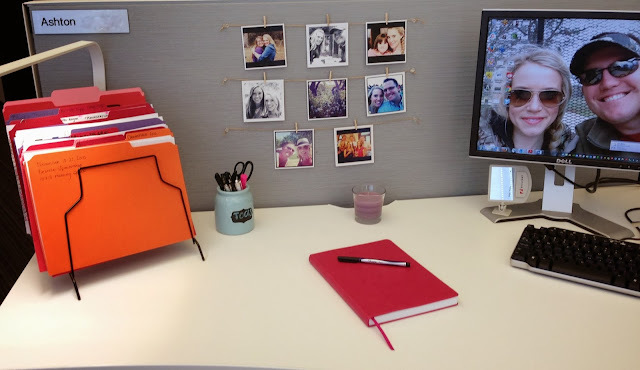 I've always had a lot of frames on my desk, but our new space didn't come with as much surface space, so I did a smaller version of this DIY at work. 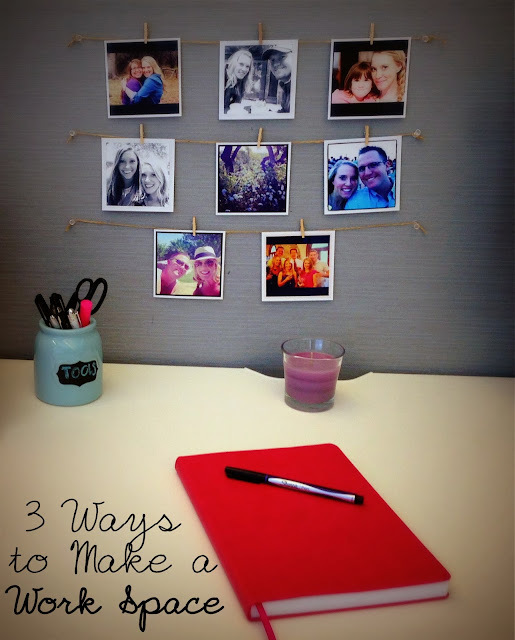 I used all the extra's from my frame project to bring these sweet faces to my work day; so easy and fun! 3. Sight & Smell: I love the soft light of a candle and a soothing smell they can have; they are constantly burning around our house. My office space allows candles, or at least no one has told me no yet and it is a great calming touch in a busy day. If your office doesn't allow candles, a candle warmer is a great alternative. When I can, I also love have a small bouquet of fresh flowers on my desk. What makes your work space? this is a great post! thank you for sharing!!! my office at work is very homey! I feel like homey make for a productive space; less stuffy! Have a great day! This is great! I always feel more productive when my workspace doesn't feel so sterile and I'm in it so often that it could use a little sprucing up!